I never knew how much I missed her. And now that song will be in your head all day. You’re welcome! 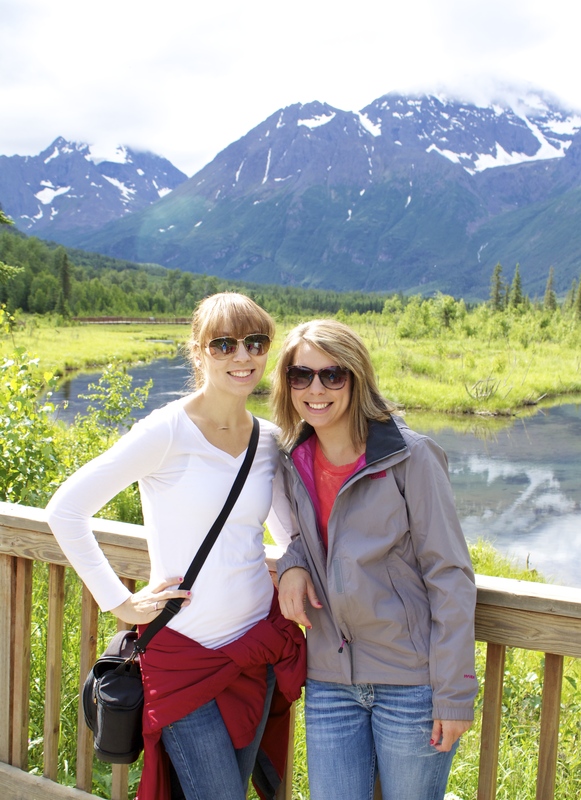 Living in Alaska has been one of the best times of my life. We are surrounded by God’s amazing creation on all sides. That picture is just up the road from my house. I’m so thankful that my family gets to experience this untamed beauty and wonder and I’ll be sad when it’s time to leave. But I miss my sister. I miss having you text that you’re coming over and then show up 5 minutes later instead of 12 hours later when your plane lands. I miss sitting around doing nothing all day while the kids play around in the backyard. Because we locked them out there. Because it was a beautiful day and they were being loud and obnoxious. I miss the Fourth of July celebrations that shook the house with those of-questionable-legality fireworks and the Thanksgiving dinners and the Christmas Eves and the birthday parties. I miss having someone I could fight with one day and still be BFFs the next day. You’re stuck with me for life so we may as well get over ourselves, right? And the person who’s eyes get a little crazy at just the same time mine do during a big family dinner when everyone is just TOO LOUD and there are too. many. opinions. I miss the person who encourages me, lifts me up, commiserates with me, laughs with me, cries with me, and is there for me. If you ever get a chance, give me a call (since you’re my sister you know exactly what I’m talking about!). Sisters are the best! Take to FaceTime and relive those moments from a distance! I love this! I have a twin sister and we are often the worst of enemies, but at the end of the day she is my best friend. This is so sweet. I wish my sister and I had that kind of relationship. I love your blog! It’s so lovely! Sisters are definitely amazing. Mine doesn’t live as far away as yours, but she did for about two years, and I missed her a lot. Now that we’re back in the same area, I wish I could go see her all the time, but it’s still a pretty far drive. I definitely miss having her close enough that we could hang out regularly. I hope you get to see your sister soon! Sisters are wonderful. Friends with a deep river that runs through each other’s hearts. I’m so glad to hear that you are dear to one another. I don’t have a sister, but a best friend I consider one! I love this! When I don’t hear from her in awhile, I feel exactly the same way! Beautiful post. I don’t have a sister, and unfortunately don’t have a close relationship with my brother… but I live very far from family (and was further once… in the boonies of Montana). The good thing about the distance is that you treasure their visits that much more. But you do wish they were more frequent! I know just what your talking about! After being gone for years now I live down the street from Jen and couldn’t imagine it any other way. Keep writing enjoying reading your messages! I also have a sister and we are very close. I blog about her often that is how big a part she is of my life.